To review the safety of performing intravitreal injections in the office compared with the operating room setting. Few studies directly compare outcomes, including endophthalmitis rate, following intravitreal injections performed in the office versus operating room setting. 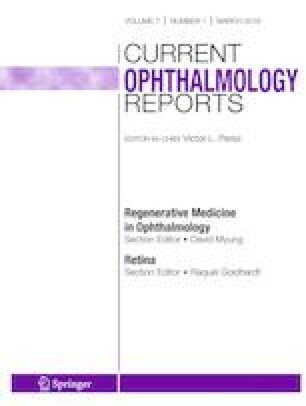 Instead, the literature on post-injection endophthalmitis consists mostly of retrospective series separately assessing outcomes of injections performed in either the office or in the operating room. These studies consistently show that the rates of endophthalmitis are low in each setting. Of the studies reviewed, 1,220,479 unique intravitreal injections were performed in the office and 285,653 were performed in the operating room. The rate of endophthalmitis was low and similar for each (0.027%). The current data suggests that it is safe to perform intravitreal injections in either the office or the operating room. All reported studies/experiments with human or animal subjects performed by the authors have been previously published and complied with all applicable ethical standards (including the Helsinki Declaration and its amendments, institutional/national research committee standards, and international/national/institutional guidelines). Jason Hsu reports grants from Roche/Genentech, grants from Ophthotech and grants from Santen, outside the submitted work. Joshua H. Uhr declares that he has no conflict of interest. Rayess N, Obeid A, Storey PP, Juliano J, Rahimy E, Moshfeghi AA, et al. Long-term visual outcomes and clinical features after anti-vascular endothelial growth factor injection-related endophthalmitis. Retina. 2018. https://doi.org/10.1097/IAE.0000000000002300.